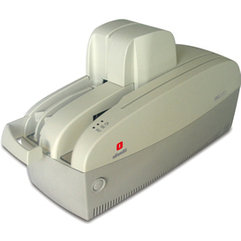 IM120D is a high-performance scanner for bank back offices, designed to handle large numbers of cheques. IM120D supports a wide variety of document formats and cheques, single or double-face scanning for colours or greyscales, MICR, OCR and barcode reading through SW libraries, a printer to endorse the back of the document and a double-feed sensor. IM120D is equipped with 2 output trays with a capacity of 50 pages each and an 80-page input tray. It can be equipped with a front and/or rear self-inking stamp and prints up to 3 endorsement lines.